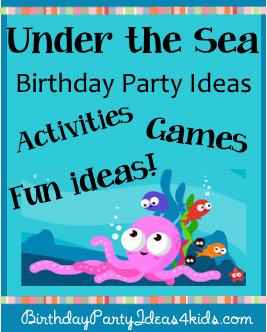 Under the Sea Birthday Party Ideas, party games, birthday activities, party food, party favors, decoration and invitation ideas. The Under the Sea party theme is great for kids of all ages, boys and girls. Print the Under the Sea party information on pretty paper (about 4 invitations per page) and cut them out. Punch a hole in one corner of the invitation and string a ribbon through the hole. Tie it onto a pretty shell and hand out to guests. Write party information on 1/2 sheets of paper and roll up like a scroll. Place inside a recycled water bottle that has the label removed for a message in a bottle. Decorate the outside of the bottle with sea life stickers and put sand or shells inside the bottle with the invitation. To make the party look like it is under the sea buy plastic or paper fish and hang them around the party room. You can attach them to fishing line and hang them from the ceiling to make it look like they are swimming, or simply attach them to the strings of helium balloons that are place on the ceiling. Sand and shells can be placed on party tables along with pieces of coral, treasure chests and plastic fish. Treasure chests and large conch shells can be used to hold snack foods. Kids dig through sand to find Under the Sea treasures. You will need a small plastic wading pool filled with sand and lots of Sea themed items like polished rocks, shells, jewelry, coins and wrapped candy. Give each child a plastic shovel and pail with their name on it and let them dig through the sand to find the treasure. When they find something they can place it in their sand pail. This game of tag has a great Under the Sea twist! Choose who will be "it" and have them stand in the center of the playing field. Use tape or if you are outside spray paint a line around the field that the players can't cross. All other players will line up on one side of the field. When "it" or the "octopus" shouts "go!" they players must run past the octopus to the other side of the field. The octopus tries to tag as many players as they can while the players are running from one side of the field to the other. When a player is tagged they have to hold hands with the person who tagged them and they become part of the octopus. Keep playing until the last player is tagged - then they become the new octopus. For starfish use a star shaped cookie cutter and cut star shapes from different food items such as sandwiches, cookies or brownies. You can also use a fish shape cookie cutter. Macaroni and cheese can be made with shell pasta for a fun Under the Sea dish. Clam Cookies - Take two sugar cookies and place icing in between them. In the middle place a small marshmallow or yogurt raisin for the pearl. Attach two chocolate chips with a small amount of icing on the top edge of the cookie for eyes. In clear plastic cups pour Jell-O and right before the Jell-O sets push Swedish fish gummies into the Jell-O to make it look like the fish are swimming Under the Sea.